Children have specific personality traits. Some are shy by nature and others are outgoing. There are children who possess natural leadership abilities and those who find more joy in going along with the crowd. Some children can’t seem to be able to sit still or be quiet for longer than 10 seconds at a time, if that, while others could play silently with toys for hours without any trouble. With each of these traits there are both benefits and challenges for parents to overcome. Few of the challenges are more frustrating than working with a child who is “bossy,” however there are positive ways to redirect challenging behavior. Get rid of the negative assumptions about bossy children. A child who is bossy most likely has strong leadership qualities and is very bright. When a child is bossy it usually means that she has great ideas and wants others to experience these ideas with her. For these reasons it is important to change the negative stigma associated with a bossy child and recognize that in time and if encouraged, a “bossy” child can become a great leader. This is especially true when tempered with compassion and empathy. Model directives that are kind. Demonstrating positive behavior for any child is important, but even more so with a child who has bossy tendencies. A child with these kinds of leadership skills will soak up every word and behavior pattern she is exposed to. Parents with a child of this temperament will need to be extra careful with how they request things from her and how they respond to her demands. Do not always let the child get her way. 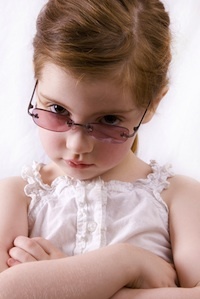 A child with “bossy” tendencies will expect to always get her own way. Often times these children are first born or only children and are used to getting to set the schedules and decide what to play with. It is very important that she does not get her way all the time. It can be challenging for parents to continually say no to her because she is so persistent and can easily wear adults out. It may seem easier to just give in and let her have her way rather than fight with her to do something different. However, it is even more important for the “bossy” child to have to learn that she will not always get her way in life. Avoid making older siblings your “eyes” for their younger siblings. Older siblings can be very helpful to their parents in many ways, but this can easily turn into a problem with a child who tends to be “bossy.” What was once a helpful set of eyes when you could not be in the room with a baby or toddler can quickly turn into a tattle tale and a child who thinks she is in charge of her younger siblings. Ignore tattling. It is important to teach your child that if her sibling or someone else in the house is in real danger, you should be notified. However, it should also be clear that tattling because she does not like the way someone is doing something is not allowed or encouraged. She should try to work out the disagreement with her sibling without your interference and with kind and calm words, not by yelling or physically hurting the other child. By encouraging her to work it out by herself and asking her to listen to the other child’s point of view, you will be teaching her empathy and compassion. Give her more control over herself. All children need some control over their lives. Often, a child who is bossy to other children and even adults is in need of extra control over her life. Because she is unable to control certain life events she is reaching to regain control of other areas and people in her life. It is not always possible to give her control over where she lives, where she goes each day, what other siblings or adults are in the house or how long she can play. In order to counteract the loss of control in these areas, try giving her greater control in other areas. Give her more choices about what and when she eats, where and when she sleeps, what clothes she wears, what she plays with and even who she plays with. “Bossy child” is an extremely negative phrase for a child who is seeking to share her ideas and excitement about life with others. Use these ideas to not only help your child become a positive and compassionate leader, but also to see her for the brilliant child that she is. Fear is a primal emotion that is essential for survival. Children fear things because they are small people in a very big world that they understand very little of. It is natural and normal for them to be cautious of new and unknown things. However, for some children, fear is a serious problem that gets in the way of their normal growth, emotionally, academically and socially. Parents who want to teach their children to trust their instincts so they will stay safe, but also want them to learn to take chances in life can follow these four simple steps. Don’t minimize or brush off their fears as not real. The fears that children have may seem insignificant and silly to adults, but they are very real and of great concern to children. If you were afraid of something and everyone went around saying that it was not a big deal and there was nothing to be afraid of, it would not help you get over your fears. In fact, it might make you more afraid and also frustrated. Telling a child that the thing that is keeping her up at night is silly will not only shame her and make her feel something is wrong with her, but will actually work to make her more afraid. Validate the concern that is behind the fear. Parents should support the worry that is causing the child fear. Validating fear does not mean that a parent tells a child they SHOULD be afraid. It simply means that the parent lets the child know that it is OK to be worried about the situation. Validation comes in many forms and can be most effective with stories of a parent’s own childhood fears and worries. The story can also be told of how the parent overcame that fear. Validating can also be done with story books of children who were worried about something and conquered that anxiety. Encourage the reasoning skills that have brought the child to the conclusion she has reached. When parents encourage the child’s reasoning skills the child is reassured that fear is not only normal, but can be defeated. Parents can say something like “I see that you have thought this out and are really very concerned about it because of ….. Have you thought of this too…?” By affirming the child’s perception parents can gain the child’s confidence. The child will then be more willing to accept alternate ideas about the situation that might help her overcome the fears she has. Find one new thing to do a week together that is a little scary for you or your child. Mark Twain said that “Courage is not the absence of fear, but acting in spite of it.” Parents have just as many fears as children do, we just have better ways of concealing or incapacitating them. Help your child overcome her fears by finding one activity that one or both of you are afraid of each week and doing it together. This will make the action less scary because doing anything with someone else makes it at least a little less daunting. When the child has done the activity once, it will be a little less troublesome to do again and she will see that fears can be beaten. She will begin to work to conquer some of the other fears she has without adult help. All children are afraid of something. One child might be afraid of climbing to the top of the jungle gym and another might be afraid of being alone in her bedroom. All these childhood fears can be conquered with a little understanding and encouragement from the adults in their lives. With the New Year just arriving, you may still be thinking about your resolutions or setting new goals for your personal or family life. 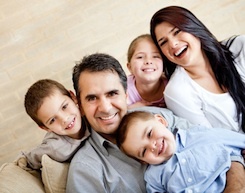 Setting goals and making new commitments can benefit both you and your family. As you think through the changes you’d like to see in your personal and family life, consider these ways you can start the New Year off right. Work on spending time together – Families tend to spend a lot of time around each other during the holidays, but as soon as they end the hustle and bustle of everyday life takes over and families often find themselves with little time to connect. The New Year is a great time to set a goal to spend at least one night a week together as a family. Create a game night or movie night once a week. Maybe even mix it up and do something different each week. Have everyone in the family come up with five family activities they want to do, then put them in a bowl and pick them out one by one, scheduling them a week or two in advance. This way everyone in the family gets to do something they picked to do pretty frequently. Limit screen time – Parents often complain that all their children want to do is watch TV, play video games or text and talk on their phones. The amount of time children spend engaged in these activities is disturbing and can be frustrating to parents. However, parents are often distracted with these devices as well. How much time do you spend on your smart phone, tablet or laptop at home around meal time and in the evenings? Challenge yourself to limit the time you spend on these devices when you could be spending time with your children. Set a new rule that there are no phones at the meal table, parents included. Spend that 30 minutes engaging in conversation with your children instead. Your older children may resist at first, but as they see you put away your phone and really connect in conversation with them, they will become less opposed to the idea. Help others – Building a sense of generosity in your children can be difficult. Working on projects to help others as a family can be a very memorable experience for them that they cherish for a lifetime. 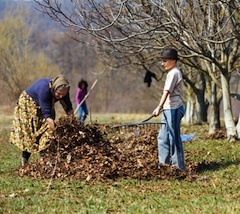 Serving at a soup kitchen, volunteering to be a part of a city wide clean-up day and signing up to do a charity walk are just a few examples of activities you can participate in with your children that benefit others. There are also a lot of smaller jobs that you can do together too. Making a meal for a sick neighbor, raking the leaves for the elderly couple down the street and taking care of a friend’s child for the day so she can rest are simple actions that make a big impact on the outlook your child has toward others. Take time for yourself – Yes, parents need time on their own. Everyone knows that. Making it happen can be challenging, but don’t forget that your child needs some time to himself too. Whether it is taking a long bath or going for an extended run, be sure to carve out time in the week to spend caring for you. You should also help your child find time for himself as well. He may have a mound of homework to finish, but he is going to be better equipped to work efficiently if he has a little down time in his day too. By setting a few goals for the New Year you and your family can build a connection and get off to a great start. Rich with cultural and historical significance, Boston is a favorite travel destination for millions of families each year. As a metropolitan area of the oft-traveled New England region and a seat of the American revolution, there’s no shortage of exciting entertainment to be found in the Boston area. From modern fun to activities with a more anachronistic bent, here are ten of the reasons why kids and their families love to vacation in Boston! The Discovery Museums (Acton, MA 01720) – The Children’s Discovery Museum and the Science Discovery Museum are two separate parts that form a cohesive whole, with something for the whole family to enjoy between them. The Children’s Discovery Museum is directed at children between the ages of one and six, offering hands-on exhibits and interactive activities to keep curious fingers engaged all afternoon. School-aged youngsters, especially those with an affinity for science, are sure to flip for a day at the Science Discovery Museum. 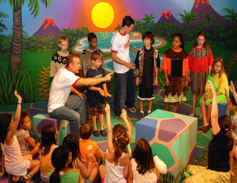 Kidstock Theater (Winchester, MA 01890) – While the activities at Kidstock Theater are directed more at residents and visitors with a more long-term stay in mind than the average vacationing family, there are single-day events available for those who are merely passing through. As a complete art center, Kidstock boasts performance spaces, instructional studios, art rooms and costume shops on their list of many activities for kids with a fondness for the arts. Plimoth Plantation (Plymouth, MA 02360) – Plimoth Plantation offers kids and their families a realistic glimpse into the lives of the first European settlers of the Colonies, as well as the Wampanoag People who already inhabited the area. A variety of exhibits, performances and other interactive programs allow kids and adults alike to explore the first days of European settlement, and how the decisions made then shape the world we live in today. Wicked RC (Framingham, MA 01702) – While there’s no doubt about the fact that the city of Boston has great historical significance for Americans, you may find your kids itching for an afternoon of fun that’s a bit more modern. Wicked RC boasts one of the best indoor remote-controlled race tracks in the area, and is sure to be a favorite destination for kids itching to leave history behind them for a moment. Boston Children’s Museum (Boston, MA 02210) – Featuring an in-house art studio that encourages kids to be their messiest, most creative selves and exhibits that emphasize cultural sensitivity and diversity, Boston Children’s Museum will offer your kids an entertaining and informative afternoon. There’s also an area emphasizing the importance of and encouraging physically active play, like climbing and powering exhibits with their own energy. Wheelock Family Theatre (Boston, MA 02215) – This non-profit theatre strives to provide both kids and the opportunity to explore and observe the ancient art of stage-play. There are classes and workshops in place for pint-sized residents of Boston, but visiting families are able to take in a production or two during their time in the city without committing to any classroom instruction. Harvard Museum of Natural History (Cambridge, MA 02138) – The award-winning Harvard Museum of Natural History isn’t just a must-see for the dinosaur junkie on your list, as it also features exhibits touching upon the space sciences and animal husbandry. Keep in mind before visiting, however, that available street parking is very limited. Beantown Trolley Tours (Randolph, MA 02368) – With several ticket locations scattered around the city, you shouldn’t have any trouble tracking down a Beantown Trolley for a guided tour of the city. Purchase of a ticket allows you access to the trolley throughout the day, as well as a Harbor Cruise from the New England or, in colder weather, a visit to the U.S.S. Constitution. Mass Audubon’s Drumlin Farm (Lincoln, MA 01773) – A working farm that also houses several species of birds, the Massachusetts Audubon Society’s 232-acre Drumlin Farm lets kids take a hay ride on nature trails, explore the farm itself and watch exciting demonstrations put on by the resident animal experts. There are also a variety of “Drop-In Discovery” activities along the way, meaning that your youngsters will be engaged throughout your visit. The Haymarket (Boston, MA 02109) – The Haymarket, an open-air produce market that’s been operating for more than two centuries in the same spot, is one of Boston’s cherished traditions. Beloved by locals and visitors alike, be prepared to encounter sizable crowds at this charming and venerable attraction. During your visit, don’t forget to sample some of the local cuisine that New England is known for. Boston boasts a strong culinary culture, playing host to several renowned eateries. A jaunt out to nearby Cape Cod, with its fishing villages, beaches and historical sites of its own is always a great way to spend some quality family time together during your travels. One barrier that parents face when trying to schedule family time is that they often have no real idea of what to do with the kids. Parents end up choosing the same activity over and over again because they have a hard time identifying something new and fun to do. If you’re looking to invigorate your family time, consider trying these classic activities with a twist. Movie night at home with a projector. Rent or borrow a projector and play a new movie or an old favorite through it. Put an old bed sheet up across the curtain rod, pop some popcorn, get some candy out and create your very own movie theater. Kids will love replicating the big screen feel from the comfort of their own home, especially if they get to pick out the movie. Read a chapter book together. Parents can pick out a chapter book from their own childhood that they enjoyed and read a little bit with their kids on a daily basis. This is the kind of activity that takes weeks and even months to complete, and will provide a lot of memorable family time. Snuggling in bed night after night with mom or dad to find out what happened next in the story will give your children happy memories they will carry well into adulthood and it will help give your children a love of reading as well. Go camping in your backyard. Camping away from home in the woods can be great fun, but sometimes you may just want a little taste of the camping experience with the option for little ones to sleep inside. Going on a camping trip in your backyard can be an enjoyable and unforgettable family activity. To authenticate the camping experience, get all the supplies together for a campfire and roast hot dogs for dinner and S’mores for dessert. If building a real fire isn’t an option, group together several candles instead. Do some research on some fun campfire songs and stories to tell around the “fire” at night. Get batteries for the flashlights so you can make shadow puppets when snuggling in your sleeping bags. Try hard to make it through the night in the tent and wake up the next morning to an early morning walk, just like you might on a camp out. Do a scavenger hunt around your city. Divide the kids and adults and conquer! Involve teens who can drive or family friends who could also help out and lead a team, then make a list of things you have to find around the city. Alter the hunt depending on the length of time you want it to take. An all day Saturday scavenger hunt with a big fun dinner at the end would make a really memorable day for your children. Let the children do as much of the thinking as possible. The best hunts have riddles or clues to help you find each thing on the list. Surprise the kids late at night and take them star gazing. For people who live in the city, this might require a bit of a drive to get away from the city haze, but it will be well worth the trip. Surprising the kids might alleviate some of the “I don’t want to sleep, I’m so excited” jitters. Put the kids to bed as normal and then after a few hours of sleep wake them up so they can go star gazing in their PJ’s. Bring lots of blankets and a flashlight or two. It is a good idea to do some research and find an open space you can visit at night. It is also a good idea to have some kind of guide to the current night’s sky. 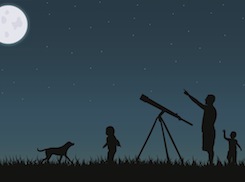 You could even go so far as to rent a telescope for the night or make an appointment at a local stargazing observation station, but these are not necessary to make the event memorable. Though bullying is certainly not a new problem that children face, in recent years it has escalated to a level that children have never before experienced. Parents whose children are being bullied often do not know how to help, however, there are many things that can be done to support, comfort and assist the child through this troubling time. Stay connected with the child’s friends by allowing and encouraging him to have friends over. When parents encourage their child’s friends to spend time at the house where parents can witness the type of interactions that occur, parents are able to better appreciate the world their child lives in. This will also help encourage the child to open up and share more experiences and feelings with his parents. Give your children a break from the pressures of their social media life. One of the reasons bullying today is so alarming is that a good majority of it does not happen in person, but instead occurs virtually through social media sites. Because of this, a good way to help protect your child from the sorrow of cyber bullying is to create a “turn off time” in the house. This is the time that all phones, computers, tablets and desktops get turned off for the night. With this rule in place, your child at least has a time when he is not allowed to see or hear any hurtful comments. It may not make the comments go away, but being forced to turn everything off for a while will make difference and give him some respite from the attacks if he is a victim of cyber bullying. Fully listen to the child’s side of the story. Sometimes parents hear part of the story and assume they know the rest. It is very important to a child’s emotional stability to be fully heard by at least one person. When a child can trust that his parents will listen to him fully no matter what, it gives him the strength to be honest about the issues he’s facing. When a child shares an incident of bullying, respond with loving concern rather than trying to immediately fix the problem. Often, when parents first hear about a bullying incident, their initial reaction is to quickly find a solution. This can frustrate a child who simply wanted someone to know what he is going though. Avoid instantly coming back to him with simple “solutions” or even cliché’s that will do nothing to help the situation. Ask the child how he wants to be helped before jumping in to fix the problem. Many times children really just want a shoulder to cry on and are not looking for parents to help them fix anything. Parents should have a discussion with their child before they come up with any solutions to the problem. Validate the child’s emotions. No matter what, the child is looking for someone to tell him it is ok to be worried, angry and even scared about being bullied. Parents can validate these emotions by sharing stories from their own childhood and making sure the child knows that he has done nothing wrong. Above all else, a child should walk away from his parents knowing that what he said is confidential and safe with them. Rather than making blanket statements, ask the child questions to help him look at the issue from a different perspective. Questions are the best way to help a child discover his own feelings about the situation at hand. Choose questions that will help him think not just about how he feels about what happened, but also why he might feel that way. “Tell me more about that.” “Why do you think that hurt you so much?” “How did everyone around you respond?” “What can you do to change the situation?” “What do you want to do about it?” These are a few questions that can help lead the child to discover how he really feels and what he wants to do about the situation. Avoid being too directly involved in any issues your children has with their peers. Most parents want to not only help the child fix the problem, but also to fix the problem themselves. While there is most definitely a time to talk to teachers and principals and to advocate for the child in other ways, the best and most effective thing a parent can do to help a child who is being bullied is to lead the child to his own conclusions about how to address the situation and then support and encourage him when he follows through on those actions. Becoming directly involved can not only be embarrassing for a child, it also make the situation much worse. In addition, it does not teach the child how to respond to these types of situations in life. No parent wants their child to be bullied, but finding the right balance of love, observation and action can help a child not only get through the difficult events that are inevitable in childhood these days, but actually become a stronger and more resilient adult because of them. 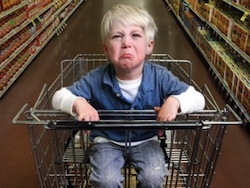 Most every parent fears that inevitable moment in the store when all eyes are on them because their adorable child is having a full-fledged temper tantrum. Many parents will go to great lengths to avoid having these meltdowns in public, even giving into every unreasonable demand the non-rational child is making. However, there are ways to escape this dreaded experience without giving into every request. Limit the amount of errands in a day you do with your child. Children have a tendency to get bored and tired more quickly than adults do when it comes to errands. There is no purpose in the errand for the child; it is just some place he is being forced to go to. Though it is important to bring a child on errands so he will learn how to interact with people in society, limiting how many he has to accompany his caregiver on can cut down on the number of tantrums in public. Prepare the child ahead of time. It is important to prepare him for any type of transition, but going into a store or other public venue requires even more planning. Give him a list of the events of the day. “We are going to three places before we come back home: the bank, the grocery store and the post office.” As you finish at each spot help him to count down how many more places he is going to go. Remind him what he enjoys about each place and what he gets to do when the errands are done and he can go home. Help the child release frustrations before heading out in public. A lot of the time parents and caregivers take an already aggravated child out into public and are then irritated when that child does not cooperate. If the child is having an off day, find an activity that will help him to release some of the frustration he has bottled up before he leaves the house. This could be in the form of some type of physical activity, having a conversation about what is bothering him, or playing a special game before he leaves. Sometimes the only way for this frustration to come out is for him to have a temper tantrum in the house. Temper tantrums themselves are not bad, they are simply a way that the child has found to release the aggravation he has. Provide some kind of non-monetary reward for behaving in a helpful manner. It is not a good idea to get in the habit of promising a new toy or candy when the child behaves well in public. This could quickly become a big problem because he will begin to expect it. However, the reward of extra time spent with his parents could be a fantastic motivator for him. Give the child a job to do to distract him when he is starting to lose it. Kids need purpose. This is one of the reasons errands and long social gatherings can get so boring for children. When parents make the event fun and give it meaning, children become less likely to feel the need to throw a temper tantrum. Let him have a meltdown without responding so that he can see that it is not an effective strategy. There are a lot of ways to avoid meltdowns. But sometimes the best way to avoid future meltdowns is to allow the one that is happening now to happen. Parents often get extremely worried and anxious when their child is screaming in public because they feel like everyone is upset or judging them. The truth is that anyone watching who has ever been a parent or caregiver of young children is feeling only empathy for that parent. The only thing parents should be worried about in the moment is what is best for their child, and sometimes the best thing is to allow him to get angry and scream with no one persuading him with threats or rewards to stop. The tantrum will pass and he will see that it has no effect on the circumstance he is in so he will be less likely to do it any time soon. There are a lot of worries parents of young children face that are very real and worthy of caution. Fear of a child having a temper tantrum in public should not be one of them. With a few simple steps, parents can confidently venture out into any public setting with even the most temperamental child. Many parents believe they are doing all they can to keep their kids safe, but with safety recommendations and standards always changing, it can be hard to keep up with what’s safe and what’s not. Here we’ve gathered 100 of the most important safety rules parents should follow to keep their kids safe and out of danger’s path. While there’s no replacement for supervision, there are things you can do to decrease the number of risks that contribute to accidents and injuries in your home. 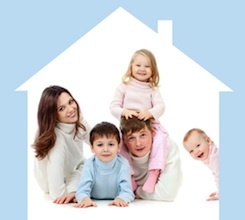 Follow these rules to increase your child’s safety while at home. Signup for recall alerts. Stay up-to-date on child-related product recalls by subscribing to the Consumer Product Safety Commission recall alerts. Turn the water temperature down to 120 degrees Fahrenheit. Hot water can scald children. By turning the water temperature thermostat down you can prevent scalds and burns. Store medications properly. Store medications out of reach and sight to prevent accidental ingestions. Use the right safety gates. While pressure mounted gates may work fine to keep kids confined to a room, they have no place at the top of stairs. Safety proof windows. Children needlessly fall out of windows each year. Be sure to add window guards or locks to your windows to be sure your child isn’t one of them. Choose appropriate toys. Choose age-appropriate toys to reduce the risk of injury to your child. Opt for a pet that is good with kids. When considering a family pet, you’ll want to be sure to select a pet whose temperament makes it kid-friendly. Clean toys without harsh chemicals. Clean children’s toys naturally to prevent the spread of germs and decrease risks associated with toxic cleaners. Store cleaners away from kids. Store toxic chemicals and cleaners out of the reach and sight of children to prevent accidental poisoning and chemical burns. Be sure smoke and carbon monoxide detectors are functioning properly. The proper placement of working carbon monoxide and smoke detectors can alert family members of a fire and prevent children from experiencing carbon monoxide poisoning. 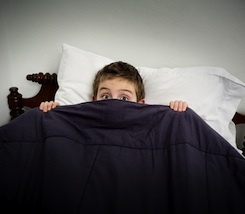 Children spend a large part of their day unsupervised in their rooms sleeping. Ensure your child has a safe sleep space by following these important safety rules. Put babies back to sleep. Since the 1994 Back to Sleep campaign was launched, the incidence of Sudden Infant Death Syndrome has been slashed in half. Don’t use an infant seat for routine sleep at home. The safest place for a baby to sleep is on his back in a safe sleep space that includes a firm mattress. Create a safe sleep space. It can be tempting to fall asleep with your baby on the couch, but you shouldn’t. Doing so poses a suffocation risk to your baby. Share a room at first. The first six months of his life you should keep your baby in your room, in a close but separate sleep area next to your bed. Avoid co-sleeping. Avoid suffocation and strangulation by providing a safe and separate sleep space for your baby. Position cribs away from windows. Keep your child’s crib away from windows to reduce the risk of falls and strangulation or entrapment in window blind cords and window coverings. Use bed rails. You can keep toddlers and young children from falling out of bed by using the appropriate bed rails. Opt for sleep sacks over blankets. Prevent the risk of suffocation by using sleep sacks instead of loose blankets. Keep the thermostat set between 68-70 degrees Fahrenheit. Keeping your child’s room a comfortable temperature can improve sleep and decrease the risk of SIDS. Don’t use drop side cribs. Since 2011, drop side cribs have been banned from the United States because they simply aren’t structurally sound. All parents know not to text or talk on the phone while driving, but do you know these other rules that can help increase your child’s safety and well-being while in the car? In addition to keeping the car free from loose objects that can become missiles in a crash, here are 10 other safety rules to follow. Use the right car seat. Be sure your child is in the right car seat for his weight and height and that the seat fits properly in your car. Have your car seat installation inspected. The majority of car seats are installed wrong. Be sure yours isn’t one of them. Use the seat properly each time. When you’re in a rush it can be tempting not to pull the harness tight enough or to skip the car seat all together. Don’t. Doing so could be a death sentence. Don’t allow jackets in car seats. Bulky coats and car seats are a dangerous combination. Know the seat belt fit test. Before moving your child to a seatbelt only, be sure he passes the test. Don’t offer food during car trips. The safest way for children to eat is to eat while doing nothing else. Monitoring a child who is eating in the back seat is impossible. Know your vehicle’s blind spots. It’s essential to know where your blind spots are so you don’t accidentally run over a small child or object. Don’t use aftermarket car seat accessories. Popular aftermarket products can compromise the integrity of the seat, decreasing your child’s protection. Don’t buy used car seats. If a car seat was in an accident it shouldn’t be used. When buying secondhand, there’s no way to know if a car seat was in an accident or not. Check your car seat’s expiration date. Car seats expire. After their date of expiration, the materials may be compromised. The backyard should be a safe haven for children to explore their world. To make it a whole lot safer, follow these basic safety rules. Use the proper surfacing under climbing structures. The proper playground surface can reduce the risk of injuries and bone fractures from falls. Don’t let kids be on or near lawnmowers. Each year children are brought to the emergency room for injuries sustained while riding on lawnmowers or running in front of them. Empty standing water. Toddlers and young children can drown in just a few inches of water. Since toddlers are top heavy, they can easily fall into things like buckets or toilets. Avoid combination bug sprays and sunscreens. While it may seem convenient to use an all-in-one product, don’t. Sunscreen needs to be reapplied more often than bug spray and it gets absorbed into the skin while bug spray sits on top of it. Be sure pools are properly fenced in. When it comes to pool safety, pool fences and locks save lives. Keep sandboxes covered. Sand boxes that aren’t covered can become an animal’s litter box, leaving your child to play in dirty, disgusting sand. Be cautious of treated wood. Treated wood can have traces of arsenic that can be dangerous to children. Know your plants. Some plants in your backyard could be harmful and poisonous to your kids. Don’t allow easy access to gas grills. Grilling can be great fun, but it can also be dangerous. Take proper precautions to ensure your child isn’t burned. Use caution with fertilizers and lawn chemicals. Chemical lawn fertilizers can be hazardous to the health of children. Sure, swimming can be a great way to spend the day, but it also comes with inherent risks. Minimize your child’s risk of drowning or injury by following these 10 rules when playing in and around water. Practice touch supervision. Regardless of skill level, children should always be closely supervised and within arm’s reach when they’re in and around water. Use caution with kiddie pools. Kiddie pools hold enough water for a young child to drown in, so children should be constantly supervised when they’re in and around them. Take wet bathing suits off as soon as possible. Young girls who wear wet bathing suits for too long after swimming are at risk for developing a yeast infection. Insist on water shoes. When heading to the beach, insist on water shoes. Hot sand can burn little feet and sharp seashells can cut them. Offer water often. Preventing dehydration is essential to keeping kids healthy during the warmer months. Apply sunscreen properly. Applying sunscreen properly is essential to preventing sunburn. Be sure pool covers are in good working order. Make sure there isn’t any space under the pool cover that children could get under and check covers regularly for pooling water. Insist on lifejackets. Life jackets are essential for kids who are in or around water, especially when boating. Only swim with lifeguards. When at the beach or lake, only swim in authorized swimming areas and where a lifeguard is present. Make smart outdoor ice skating choices. Before skating on a frozen pond or lake you should make sure that the pond or lake is completely frozen and that it’s been approved for skating on. Many parents worry about their children choking, and for good cause. Choking is not only scary, it can also be deadly. To reduce the likelihood of choking and choking related deaths, consider following these 10 rules. Avoid risky foods. Certain foods, like popcorn and hot dogs, are risky for young children. Avoiding these potentially hazardous foods can reduce the risk of choking. Have current CPR and first aid training. Armed with choke saving skills, parents who take CPR and first aid are better prepared to handle an incident should one arise. Enforce hand washing before and after eating. Hand washing can prevent the spread of illness and help keep kids healthy, especially during flu season. Recognize the signs of an allergic reaction. Parents should pay close attention when offering foods and be familiar with the signs of allergic reactions. Store foods properly. All leftovers and refrigerated foods aren’t created equal. Don’t mistakenly serve foods that have gone bad. Don’t cross contaminate. Whether it’s to prevent allergies or the spread of bacteria, cross contamination can have serious effects on your children’s health. Look at expiration dates. Understanding food expiration dates, what they mean and what they don’t can help ensure you avoid feeding your family foods that have gone bad. Don’t send babies to bed with bottles of formula or juice. Sending babies to bed with bottles full of formula or juice will do more than quench their thirst. Doing so also promotes tooth decay. Brush teeth 30 minutes after meals. While most parents have been conditioned by their own parents to brush right after meals, doing so can actually cause more harm than good. Don’t share spoons. Many moms are surprised to learn cavities are contagious. By sharing your spoon, even to show your child how good dinner really is, you’re passing germs back and forth. Many children spend the majority of their day in daycare. Help ensure your child’s safety when you aren’t with him by following these 10 rules. Ask about physicals. Daycares that require children to have physicals show that they are dedicated to protecting children and their health. Get independent verification. Conduct your own background check or hire someone to do it for you to ensure the daycare provider is who she says she is and has the qualification to provide high quality care. Ask the right questions. Asking the right questions can help you choose a quality childcare provider. Monitor quality of care. Understand what goes on in your child’s daycare and keep close tabs to be sure everyone is doing what they’re supposed to. Choose a licensed daycare. Licensed daycares have to undergo inspections and comply with local and state laws to stay in business. Choosing one ensures the center has some oversight. Look for accredited programs. Daycares that opt for voluntary accreditation go above and beyond to meet higher standards set forth by independent accreditors. Inspect the location regularly. Before you choose a daycare center and throughout the duration of your child’s enrollment, stop in unexpectedly and look around for any safety red flags. Ask about security measures. Be sure to ask about what safety measures are in place to keep your kids safe while at daycare. Provide updated emergency contact information and consent forms. Having consent forms and contact information readily available can ensure your child gets the best care possible if an emergency should arise at daycare. Stay connected. Are you involved in your child’s daycare experience? Recent studies say you should be. You send them off and greet them when they, or you, return home, but do you really know what goes on during their day? Take action to help keep your children safe at school by following these safety rules. Bullyproof your kid. Don’t let your child become a bully’s next victim. 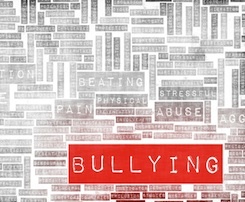 Teach him effective strategies for standing up to a bully. Talk to kids about their day. Spending 15 minutes a day talking to your kids can help clue you into school problems. Be involved. Parents who are involved with their children’s school experience have better school success. Teach kids how to cross the bus safely. Getting to and from the bus can be more dangerous than riding it. Show your children how to board and get off the bus safely. Don’t let kids walk or bike to school alone. Think twice before letting your child walk or bike to school alone. Doing so could be considered neglect and put your child in harm’s way. Teach kids their phone number and address. Teach children their name, address and other important information so they are able to identify themselves and their parents if needed. Talk about stranger danger. Raise street smart kids by educating them about child predators. Ask the school about safety measures. Do you know how safe your child’s school is? Evaluate your child’s school security measures. Pay attention to Internet use. Monitor your child’s Internet use to help keep him safe online. Role-play situations. Role-playing with the kids can help prepare them for dangerous or uncomfortable situations. Taking a family vacation can provide for lots of fun, but it also places your family in unfamiliar surroundings with lots of people, places and things to navigate. Prepare to keep your kids safe by following these vacation inspired safety rules. Use an FAA approved seat when flying. Don’t be fooled into letting your child ride on your lap or taking a non FAA approved seat to the airport with you. Keep your kids safe when flying with an FAA approved seat. Abide by ride regulations at theme parks. Height and weight limits on rides are established for a reason. Resist the urge to sneak your kids onto rides that they don’t qualify for. Don’t label kids clothes on the outside. Avoid clothing that has your child’s name it. When strangers call a child by name it can give them a false sense of security that the person knows them. Help your kids get help. From tucking business cards of the hotel into their pockets to writing their phone numbers on their arms, there are lots of ways to ensure your kids can get help should they become separated from you. Consider a preprogrammed cell phone. A preprogrammed cell phone can help your child reach you or someone who can help should they need to. It can also ensure you have quick and easy access to important contacts while traveling. Designate a meeting place. Establishing a dedicated meeting place can help your family members find each other if they become separated. Take your regular nanny with you. Having a caregiver who knows your child and family can better anticipate your child’s health and safety needs than a caregiver hired on location. Heed travel warnings. Whether it’s for security or weather, travel advisories are issued for your protection, so you should think carefully before ignoring them. Use appropriate safety gear. Whether it’s a helmet for riding a bike or a life vest for boating, be sure your children are using the appropriate safety gear on vacation excursions. Check immunizations. Before traveling overseas, be sure to take your children to the travel clinic to ensure he has the proper immunizations required for travel. The Internet is full of useful information, but it’s also full of threats. Keep your kids safe online by following these important safety rules. Keep computers in public areas. When the computer is in the main areas of the home, monitoring its use is easier. Limit screen time. Limiting screen time limits exposure and helps keep kids healthy. Monitor usage. Quality and quantity of screen time are both important factors in keeping kids safe while using the Internet. Teach kids not to give out personal information. Kids should be taught to help keep themselves safe by teaching them to keep their personal information private. Keep passwords on hand. Knowing your kids passwords can help boost accountability for online activities and monitor use. Abide by site rules. Some sites, like Facebook, have rules that permit only users of a certain age to utilize the site. Do you follow the rules? Talk about anonymity. While a real world policy of using your name online is the direction some think should be established, the reality is people can post under any name and pretend to be anyone. Teach your kids this important piece of information so they know their new online teen friend may not be who he says. Check mobile usage. Tracking your child’s online usage from his mobile device can alert you to any security concerns. Set parental and security controls. Be sure your child’s security setting are up to snuff by limiting what he can see and share with the world. Be Facebook friends. Being your child’s Facebook friend can help keep the lines of communication open, help you to monitor his social activity, and help you get to know some of his friends. Founded as a Spanish settlement on the banks for the Rio Grande river in 1706, the desert city of Albuquerque is the sixth fastest-growing city in the United States and very heavily planned. As such, it’s relatively easy to navigate and filled with a plethora of informative and fun attractions for visiting kids and their families. If you’re in search of a family vacation destination that’s a bit less common than the old-faithful amusement park and touristy standby cities, Albuquerque may be just what you’re looking for. Rio Grande Zoo (Albuquerque, NM 87102) – The Rio Grande Zoo is like visiting three attractions at once, as it’s housed in the Albuquerque BioPark which also features the Albuquerque Aquarium and the Rio Grande Botanic Garden. Home to more than two hundred and fifty species in carefully designed habitats, the Rio Grande Zoo also offers a variety of interactive opportunities, demonstrations and educational programs for young visitors. The Box Performance Space (Albuquerque, NM 87102) – Kids with an affection for the performing arts are sure to get a major kick out of The Box Performance Space, which hosts a variety of improv performances, children’s shows and even improv classes for youngsters. Make sure you don’t miss this gem if you have a budding thespian in the family! American International Rattlesnake Museum (Albuquerque, NM 87104) – Kids that have an interest in all things slithery and reptilian will be awed by the impressive collections of rattlesnakes at the American International Rattlesnake Museum, which provides plenty of information for each snake on the premises, including the history, origin, genus and species of each reptilian inhabitant. Explora Science Center and Children’s Museum (Albuquerque, NM 87104) – Learning about technology, science and art in a hands-on environment that encourages plenty of interaction, exploration and experimentation helps kids retain those lessons, which is why the Explora Science Center and Children’s Museum is a must-see attraction while you’re visiting Albuquerque. New Mexico Museum of Natural History and Science (Albuquerque, NM 87104) – Walk through a volcano, explore the ice age and navigate a cave at the New Mexico Museum of Natural History and Science, which also features eight Timetracks exhibits showcasing the history of New Mexico from the present, all the way back to the Paleozoic era. 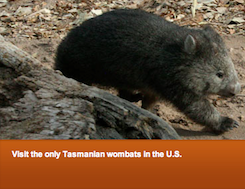 Don’t miss the IMAX theater, planetarium and the hands-on experience of The Naturalist Center! National Hispanic Cultural Center (Albuquerque, NM 87102) – The architecture of the National Hispanic Cultural center alone is worth seeing, making it an ideal setting for the artifacts and exhibits showcasing Hispanic culture and art. On the premises is also the Roy E. Disney Center for the Performing Arts, La Tiendita Gift Shop and a Research & Literary Arts Complex. Sandia Peak Tramway (Albuquerque, NM 87122) – The world’s longest tramway, Sandia Peak Tramway, stretches over 2.7 miles and offers breathtaking views of the Sandia Mountains, the city of Albuquerque, hiking and mountain biking trails. There are also dining options at both the base and peak of the Tramway. Albuquerque International Balloon Museum (Albuquerque, NM 87113) – If you can’t make it to Albuquerque for the International Balloon Fiesta, a stop at the Albuquerque International balloon Museum is the next best thing. Dedicated to the science, art and history of ballooning, all of your kids’ questions about balloon flight are answered through the exhibits and artifacts on display. The National Museum of Nuclear Science & History (Albuquerque, NM 87123) – The Congressionally chartered National Museum of Nuclear Science & History offers kids the chance to explore the atomic age from the earliest research to modern use. Albert Einstein, Madame Curie and the Manhattan Project are among the many subjects of permanent exhibits, and the on-site store offers plenty of nuclear physics and atomic energy-related merchandise. Holocaust & Intolerance Museum of New Mexico (Albuquerque, NM 87102) – While the horrors of the Holocaust may seem a bit heavy for very young children, there’s no doubt of the importance of teaching kids about tolerance. Talking points on everything from genocide to schoolyard bullying are offered at the Holocaust & Intolerance Museum, which is not dedicated to any specific time, area, culture or religious affiliation. While Albuquerque has a variety of year-round offerings for visitors, there are also a number of annual festivals and celebrations held within the city. From the Native American Gathering of Nations Pow-Wow to the Albuquerque International Balloon Fiesta, there are plenty of unique cultural festivals that can make your visit even more exciting for the whole family.